The Sharp Shinned Hawk has been making a living around the house for over two months and become our coffee and cocktail entertainment. We do all but applaud its low flap and glide aerobatics in pursuit of startled quail. Though probably only a temporary guest, we’ve become comfortable with one another’s tastes and habits. 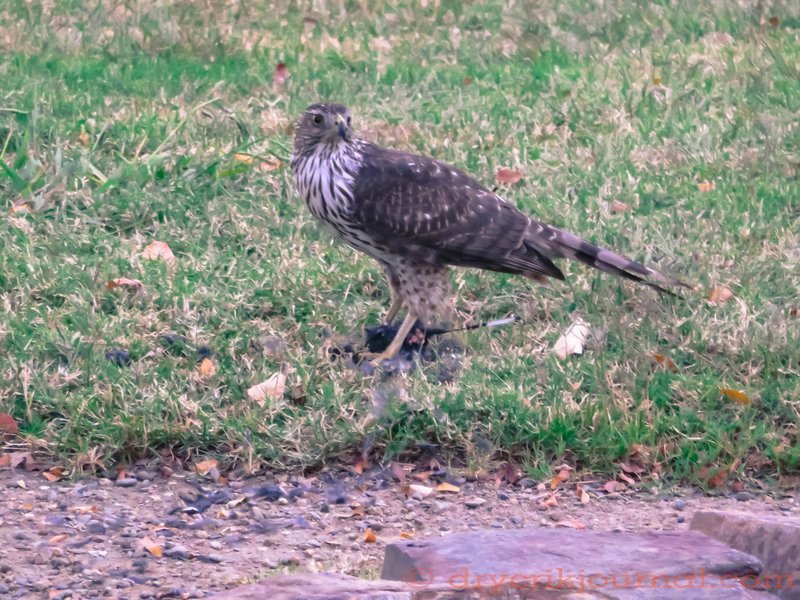 Not too persnickety, the Sharp Shinned Hawk taunts us with ground squirrels (dead or alive) quail and ringnecked dove. Last night, a Black Phoebe was the casualty. This entry was posted in Haiku 2017, Photographs and tagged haiku, photography, poetry, Sharp Shinned Hawk, wildlife. Bookmark the permalink. I love watching hawks. In one of my jealous moods last week, I told myself to remember they have to kill for their supper—otherwise, I would wish myself into being a hawk.